As good as I generally am about eating, breakfast is the one area where I falter. Generally I dont eat breakfast, but lately Ive been forcing myself to get into the habit by developing super quick super healthy takes on some of my favorite breakfast guilty pleasures. FYI all recipes are single servings but can easily be multiplied and modified to your taste! As tasty as these tempting to go meals are, they arent necessarily the best for you. Fried egg, cheese and meat on bread….not exactly the healthiest start to your day is it? My solution, a Poached Egg Breakfast Salad that you can make in under 10 minutes and you dont even have to dirty many dishes! First you need to wash clean and dice up all the veggies. Place them in a bowl and set aside. Take a small bowl (one that can hold about 2 cups of water) and fill 2/3rds full with water then add a dash of white vinegar. Crack an egg into the bowl (do not break yolk) and cover with a plate. Place in your microwave and cook for about 80 seconds or until the white is no longer translucent. I prefer super runny eggs so I usually cook a little under 80 seconds but by all means cook longer if you prefer a firmer yolk. 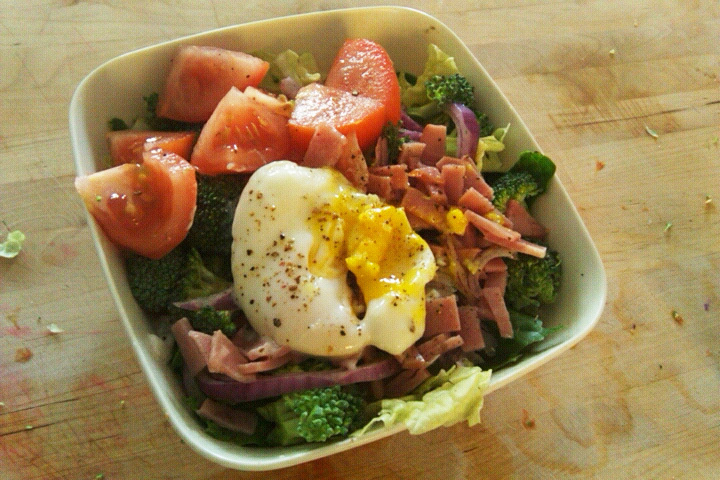 While the egg is cooking take a slice of turkey ham and dice it finely and add it to the salad. Once the egg is done, spoon it onto the salad. Top with some fresh ground pepper and hit it with a bit of white balsamic (if you dont have white balsamic white wine vinegar or regular balsamic will do). Split the egg and enjoy! This is probably my all time favorite breakfast guilty pleasure…the rich cream cheese…the smoky rich salmon…the hearty bagel…the tangy onions…it all comes together for flavor euphoria. Unfortunately, bagels and cream cheese arent exactly the healthiest option in the morning. So, I developed a healthy and gluten free way to enjoy my favorite breakfast treat! This one honestly couldnt be easier and tastes so indulgent! Take your rice/corn cake and put a hefty spoonful of cottage cheese on it. Place the lox on top of this then top with the tomato and onion. Sprinkle it with capers if you prefer (Im a big capers fan but they may be too salty for some) and crack some fresh black pepper. Hit it with a squirt of lemon and enjoy! So there you have it, two breakfast guilty pleasures redone to be healthy and quick. I do both of these on a regular basis and neither take more than 5 minutes and can even be made in the office (just bring pre chopped veggies). Enjoy!